As if planning for the future of mid-Solano were not enough, the first public meeting regarding planning for the future of San Pablo Avenue took place in Albany a week ago last Thursday. Planning is really heating up as or because the planet is too. 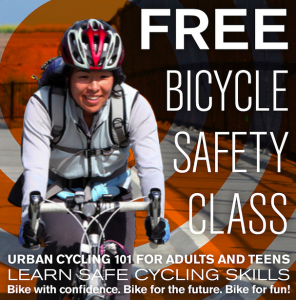 The Alameda County Transportation Commission (Alameda CTC) as an agency is leading this effort. It presented three alternatives. Concept C leaves the street essentially as is with some minor adjustments. 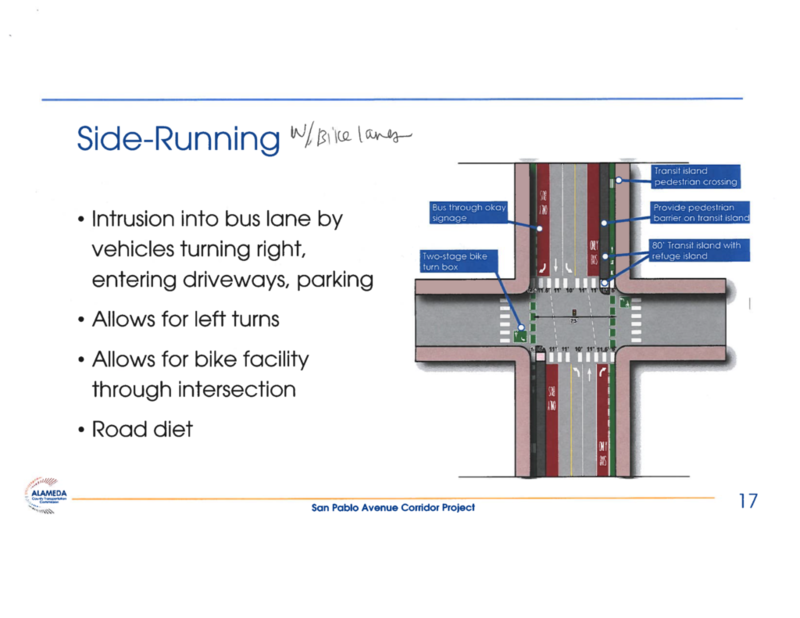 Concept B with center-running dedicated bus lanes, one through general traffic lane, and dedicated general traffic right turn lanes at major intersections. And Concept A is the same as the last but with a parking-protected cycling lane in one direction and a buffered cycling lane in the other. The general preference was for Concept B (center bus lanes only). Concept C does not facilitate bus transit, which service is projected to decline dramatically due to increasing traffic congestion. Concept A removes parking all day long on one side and the cycling lanes provided end before major intersections to make way for general traffic dedicated right turn lanes, so they do not accomplish much. In contrast, parking in Concept B in the northbound direction is prohibited during the evening commute to reduce congestion but is otherwise available. However, Concepts A and B move the bus stops away from major intersections to preserve space there for dedicated general traffic left turn lanes. It is odd, to say the least, to propose improving bus transit by degrading it by moving the stops away from the main intersections where retail is centered. Also odd is that Alameda CTC did not list keeping the bus stops at major intersections as an advantage in Concept C as the converse of this disadvantage in Concepts A and B. Concept B also requires providing parallel relaxed cycling routes since they are not provided on San Pablo. The Alameda CTC counts these a positive, discounting that using them would impose up to a three quarter mile detour in some areas (not in Albany). So this feature of Concept B is neutral as best, and reasonably considered a negative. There is actually another concept considered by Alameda CTC that it ruled out without showing to the public. This is dedicated side-running bus lanes. Alameda CTC ruled this out because it would not sufficiently improve bus transit operations because motorists would be allowed to enter the lane to turn right and parallel park. However, it seems there may be signalization means to address the first concern. Against this downside, this concept, call it D, has the safest conditions for sidewalk users at major intersections because it allows bulbouts, the best conditions for people cycling because it provides protected lanes right up to all intersections. It is not clear whether Concept B or D is better. AS&R is considering undertaking advocacy to get Concept D considered equally and in parallel with the others to provide a more meaningful process. 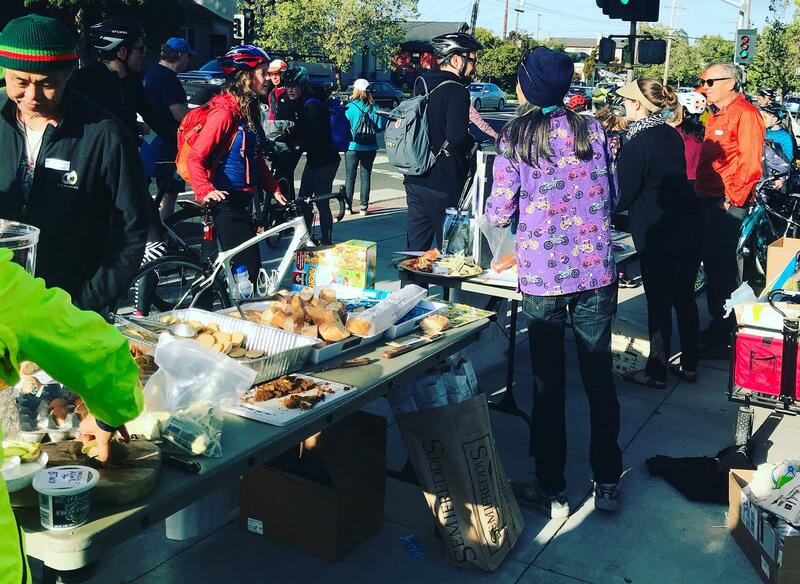 As of the last GREENways sent on March 19th, the Traffic and Safety Commission had voted unanimously for the complete alternative supported by AS&R to be included in the Mid-Solano Complete Streets Plan. This design has wider sidewalks, an uphill cycletrack or parking protected cycling lane, parallel car parking on the north side for safer cycling downhill, and maintains the current car parking inventory. The next night the Climate Action Committee unanimously rejected the primary design put forward by the consultant to widen the sidewalks a bit and add more car parking, even though Albany’s own parking study adopted by the Council in 2017 recommends against doing so. The Committee also unanimously voted in favor of the design supported by AS&R. This was all particularly good news because this Committee was not even planned to consider the Mid-Solano plan as of late February, which was exceedingly odd given that the majority of Albany’s greenhouse pollution results from transportation. As a result of the Climate Action Committee’s vote, the prospective schedule to have the Council adopt the consultant’s plan on April 15th has completely fallen apart. Staff first relayed that the Council’s consideration would be delayed until its second May meeting. Late last week staff updated this relaying that over the next two weeks staff and the consultant would be developing a new schedule including a public process around the AS&R-supported alternative. This suggests the Plan will not go to Council until June at the earliest and most likely later than that. 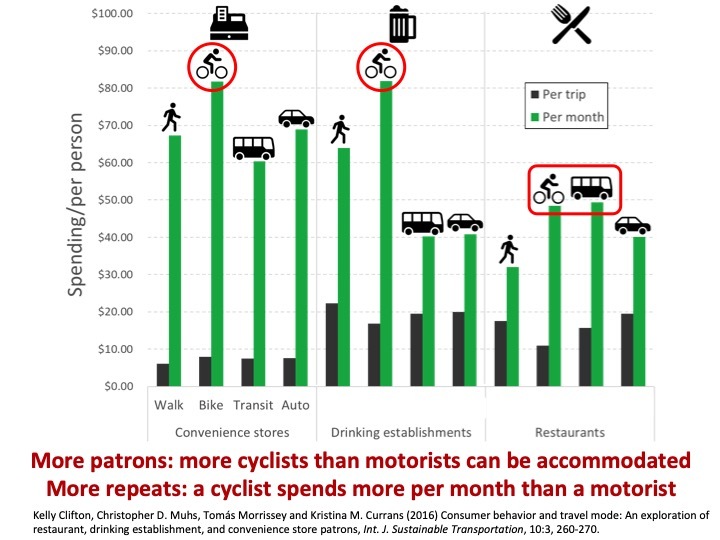 Meanwhile, enjoy the graph below showing the results of one study regarding how much people spend locally by different transportation mode. This graph contributed to the Economic Development Committee continuing consideration of the mid-Solano Plan to date uncertain to allow itself more time for study when faced with the question of more car parking or possibly more business revenue by dedicated space to other modes. AS&R has expressed disappointment in the Solano Complete Streets Draft Plan that was released in February 2019. The plan offered no improvements for people riding bikes on Solano Ave. We heard from many people that bikes don’t really belong on Solano Ave., there are good alternative east-west bike routes nearby, and if we want to shop on Solano by bike we should just arrive from a side street and park at the corner. This is antithetical to the concept of Complete Streets. The Traffic & Safety Commission took a big step to improve the plan at its meeting on February 28th. 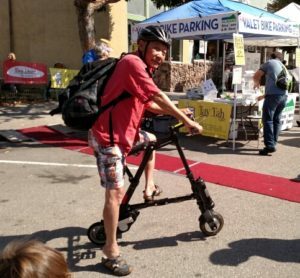 The Commission viewed a new alternative design that would welcome bike riding on Solano, offer more sidewalk space for people walking, and maintain roughly the car parking capacity that the street has today. The new design provides a safe, protected bike lane for people riding uphill, avoiding conflicts with drivers using the diagonal parking. In the downhill direction, bike riders would share the lane with car traffic, alongside a parallel parking strip. The Traffic & Safety Commission unanimously asked for the new alternative to be included in the plan. The primary design in February’s draft plan devotes more public space to car parking and does not recommend any tools to manage parking demand. It makes no improvements for people biking. It widens sidewalks a little, but not enough for a main street. Some features meant to help people walk across the wide street would create new hazards for those biking. AS&R opposes this design. February’s draft plan recommends studying back-in angled parking as an alternative to today’s parking configuration. This would improve safety for people biking, but would not encourage a wide range of people to try biking. AS&R enthusiastically supports the new design with the protected bike lane. It provides safe spaces for people to ride bikes from ages 8 to 80, devotes more space for walking, and does not encourage additional driving. This is a true Complete Street. 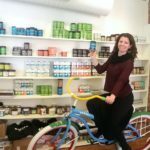 Bike to Work Day Coordinator Needed - FOUND! 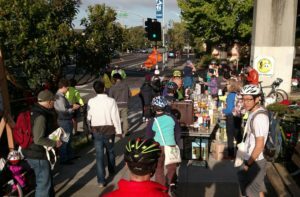 Standing Room Only at AS&R’s 2018 Bike to Work Day Energizer Station! 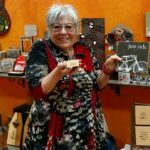 UPDATE – Elizabeth Vahlsing answered our call to co-coordinate 2019 Bike to Work Day! 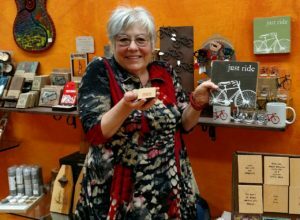 It’s the beginning of February, but advocates are already gearing up for Bike Month in May, and Bike to Work Day (BtWD) May 9, 2019. 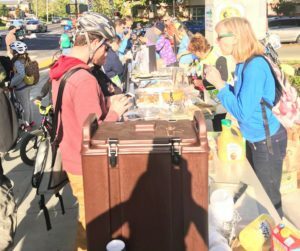 Every year for many many years now (almost since BtWD began), Albany has had a successful and well-attended Bike to Work Day Energizer Station on the Ohlone Greenway in the morning. I (Nick Pilch) had the privilege of running this station for a number of years and it always gave me a thrill to see the community getting together and celebrating the use of pedal power as a way to get to work, or school, or wherever you’re going. There was plenty of food, thanks to our generous donors, and volunteers distributed it and plenty of information! Albany Strollers & Rollers is in need of an organizer for this year. 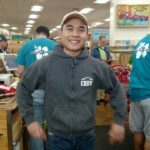 As an organizer, you would be in charge of being a liaison with Bike East Bay, who coordinates efforts in the area. You would also organize efforts of the day of. 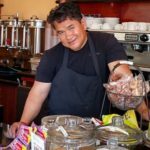 Finally, solicitations of donations, and local publicity are also part of this effort, but you would have a lot of help. A number of us (Nick, Ken, Amy, Sylvia) can answer any questions and help out with these things, as well as drum up a bunch of other volunteers for you. We just need a main organizer. Your help would go a long way towards advancing Active Transportation. 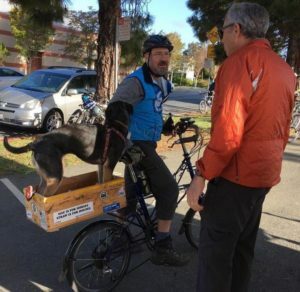 A kick-off meeting with Bike East Bay is coming up this week, and it would be really helpful if you could attend that if you are interested. Attendance at that is not mandatory, but it would be a great way to learn more. Please reach out to contactus@albanystrollroll.org if you have any questions or interest at all, and we thank you so much for considering! Stuffing bags for everyone who rolls by is FUN!! If you can help, please email Ken at kenmccroskey@gmail.com – thanks! 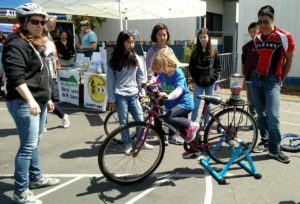 AS&R volunteers parked hundreds of bikes at the 44th Annual Solano Stroll! 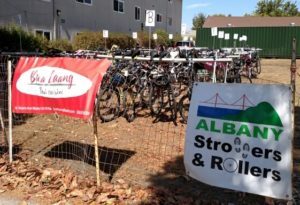 Albany Strollers & Rollers had another successful Solano Stroll (the 44th annual!) on Sunday, September 9th. Thanks to the many volunteers who were busy from 9am-5:30pm on a bluebird day, we parked more than 280 bicycles on our “Moved By Bikes” Valet Racks at two Bicycle Valet Parking lots. Visitors from Oakland, Walnut Creek, San Francisco, San Leandro, Pinole and beyond had ridden to the Stroll – some with an assist from BART – and expressed gratitude that we were there to look after their steeds. More than once I was told that without our service, they would have skipped the event. 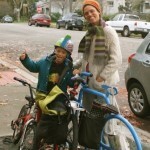 People of all ages, bikes of all types! 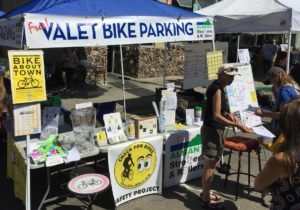 Our Bicycle Valet Parking volunteers were expertly led by Sylvia Paull, Barb Altenberg, Joseph Friedman, Mac McCurdy and rackmeister Ken McCroskey. Volunteers Shauniece Williams (who worked all day with barely a lunch break!! ), Dave Nicely (he of 3 Stroll booths! 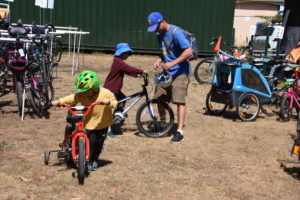 ), Mike Gill, Nico Primmer, Joan Gallagher, Shantee Baker, Anne Malamud, Bryce & Lyell Nesbitt, Reuben from Brooklyn, John Alexander, Ian MacLeod, Tony Caine, Jackie Wang and Jacky Zhao helped check in, park and retrieve bikes. We needed every single one of you to make the operation go smoothly! Extra added bonus – there were zero unclaimed bikes at the end of the day! Our table was hopping all day and volunteers answered any & all questions! As I was suffering from a wrenched back, I especially appreciated the proactive setup crew (Michael, Shantee, Eileen, Ken, Nico, Barb & Sylvia) who lifted, moved, hung, taped and placed tents, tables, banners, racks, signage and gear flawlessly! 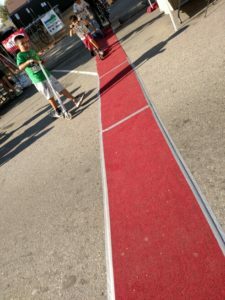 Where else can you scooter down a Red Carpet? enjoyed delicious lunches! 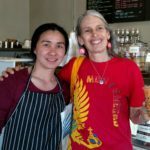 Cathy from Kim’s Cafe & Sandwiches brewed up some special Mango Mint Iced Tea for volunteers & visitors, and Desiree of RXBAR donated hundreds of delicious protein bars for all the volunteers and many visitors, too! Special thanks to Grizzly Peak Cyclists who lent us their two pop-up tents via Sherie Reineman, Robby from Abrams Claghorn Gallery for letting me store some of our large gear in the back of his gallery, Bradley Blackshire for purchasing drink dispensers & trays for AS&R, Fern’s Garden and BikeLink for providing gift cards, Laurent from Rendez-Vous Cafe Bistro for sponsoring our reflective bands, Janka from Floor Dimensions for the “Red Carpet” that led cyclists up the ramp to our west lot, Francesco for building the customized ramp, and Brad & Linda Carlton, who lent us their folding tables. Upon further reflection, we had another great Solano Stroll! 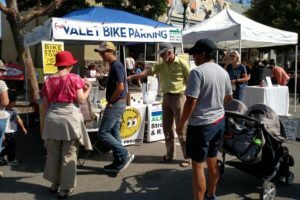 A final thank you goes out to Allen Cain and the Solano Avenue Association, who make Bicycle Valet Parking a priority for this huge regional event and put us in a position to succeed every year. It’s an honor to be associated with one of the region’s longest-running and best street fairs! We hope that YOU will join us for #45! If you’ve gotten this far and appreciate the service AS&R provides, please vote for us (you!) in category #32 for “Best of Albany Community Service” award here! VOTE FOR AS&R FOR “BEST OF ALBANY COMMUNITY SERVICE AWARD!” BY SEPTEMBER 19th! Hey gang, here’s your chance to acknowledge your favorite community service organization, us, Albany Strollers & Rollers! Every year the Albany Chamber of Commerce holds a Best of Albany contest. There are 37 categories this year – you can skip some, but please vote in category 32, “Best of Albany Community Service Award.” Be sure to click “Done” at the bottom of the page. AS&R members help keep Albany rolling!! For more than one voter in a household using the same, shared computer, be warned that multiple votes are locked out unless you delete cookies between your votes or use different browsers. Help pump AS&R up by voting for AS&R in category #32, Best Community Service organization – thanks! Thanks for your support and for being a part of AS&R! Winners will be announced September 27th. 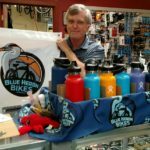 Another Successful & Fun Bike Month! 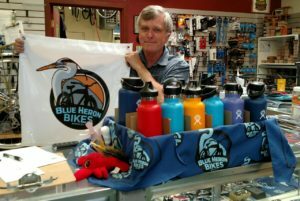 Bike Month 2018 is not quite over but we can report on the fun and successes that we all had, thanks to the volunteers at all the events! 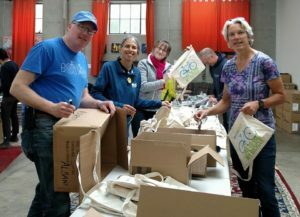 On May 4th Gjergji, Joan, Julie, Ken and Will stuffed 300 musette bags full of swag – bike lights, information, discount cards, snacks – for the upcoming Bike to Work Day…without those great Bike East Bay bags, Bike to Work Day wouldn’t have the cachet that it has! Almost a week later, the 25th annual Bike to Work Day was a rousing success. At our Albany Energizer Station, more than 500 cyclists went by while we were there. Thank you to all who stopped by to eat, drink, get your bike checked or chat about bike stuff! 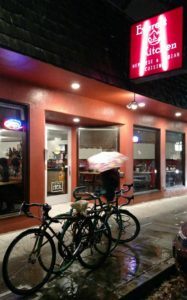 I’d to thank Bradley B, Francesco P, Jane L, Jessica M, Julie W-L, Ken M, Mac M, Margo W, Mike G, Nick P, Peggy M, Pete M, Bike East Bay’s Ruth K, Samantha H, Shoey S, Sylvia P and “the Backroads Bunch” of Breeze W, Brittany H, Cooper M, Melissa P & Stacy L for staffing the station, setting things up, distributing swag & snacks, counting cyclists, and just keeping things running! Without YOU, the volunteers, this absolutely could not happen. Jessica, Mac, Mike and Francesco each took some great photos documenting the fast-paced morning…as did Melanie, on her way to work! Francesco even took this video, for those of you who want to relive the fun or see what you missed. There was plenty of food and drink for everyone, thanks to the generous donations by local businesses Kim’s Cafe (Cathy) and Royal Ground Coffee (Mike) Trader Joe’s El Cerrito (Dao,) Semifreddi’s (Rachael,) GU Energy (Jessica & Germán,) Safeway (Cherise & LaToya) and Sprouts (Brenda & Jen), plus Barney Butter (Alexandra) non-GMO almond butter from the Central Valley! And Mattison L volunteered to do the shopping at Safeway and Sprouts, taking a load off of Ken!! 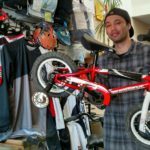 Rob from Blue Heron Bikes and Winston from Berkeley Bikes & Skateboards volunteered their time, checking your bicycles for safety and road-worthiness as they have in previous years! Bradley with freshly baked Semifreddi’s bread! Bradley Blackshire of Edward Jones did triple duty: as a sponsor, he bought AS&R drink dispensers, serving trays and tongs that we can use at all future events; as an Alameda resident he picked up 50 baguettes fresh from the oven at Semifreddi’s for our Energizer Station; then he volunteered all morning at the station! Cyclists streamed by all morning! Nice turnout for 2018’s first Bike About Town! Bike About Town family fun rides began on May 18th and we had a fine turnout for a loop around Albany. Brennen from the City of Albany, Gjergji, Jerry, Ken, Sylvia and I rode with the group and had a great time. I hope more of you will join us on upcoming rides! 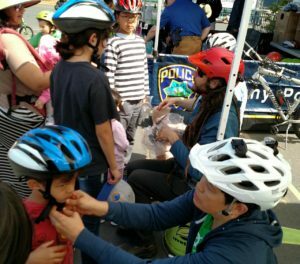 APAL gave out free helmets and AS&R volunteers made sure they fit the kids. 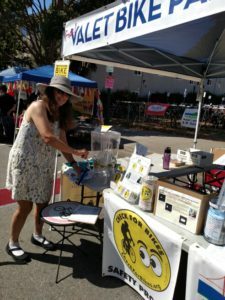 The APAL Bicycle Rodeo took place last Saturday. 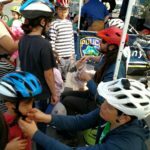 Hundreds of kids and their parents enjoyed a cycling confidence course run by Cycles of Change, BMX demos, the famous “Bike Blender,” getting their face painted by Ping F, and talking to me about how to safely ride on the streets of Albany and beyond. Britt T, Gjergji Z and Ken M fitted some of the 100 new helmets that Albany PD gave out, and tweaked old helmets, too. EVERYONE loves pedal powering – and drinking – a fruit smoothie! 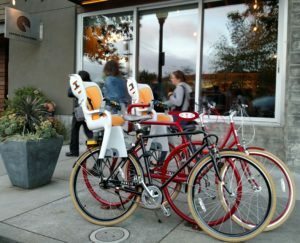 If you bike to Tay Tah from Monday through Friday during May, when you buy one Boba Drink you get another of the same flavor FREE! So ride over with a friend and enjoy! 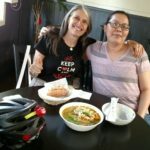 If you bike to Bua Luang, when you buy one kid’s meal you get another kid’s meal FREE! 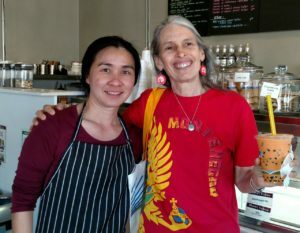 I want to give extra recognition to businesses and owners BLUE HERON (Rob), BUA LUANG (Pat,) AND FERN’S GARDEN (Fern, obviously) for donating special gift cards or coupons for all of our Bike Month Volunteers as a thank you for your time and service to the community!!! 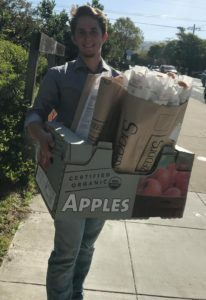 I truly appreciate those small businesses, as well as our other supporters (see description of BtWD) for going the extra mile to give back to AS&R’s volunteers and show that they are really involved with our community! 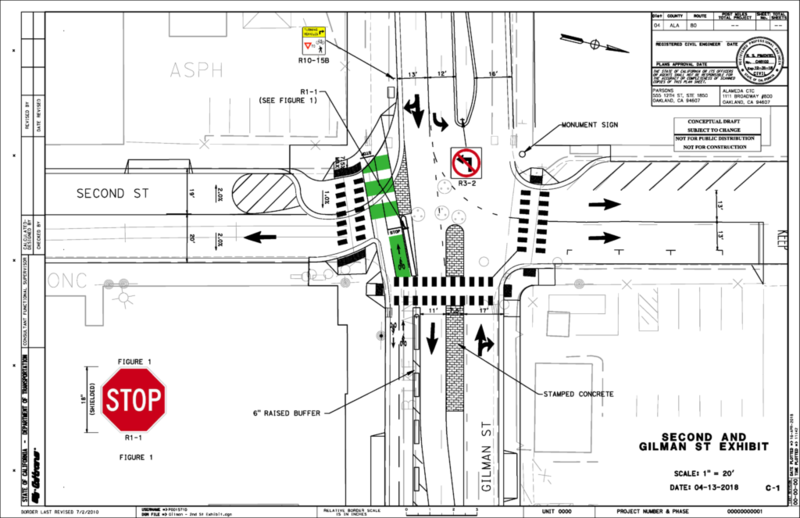 As part of the reconstruction of the Gilman Avenue interchange at I-80, an active transportation overpass of I-80 will be built to accommodate the vast majority of people that would bike or use sidewalks to the waterfront but not if they have to go along Gilman under the freeway. 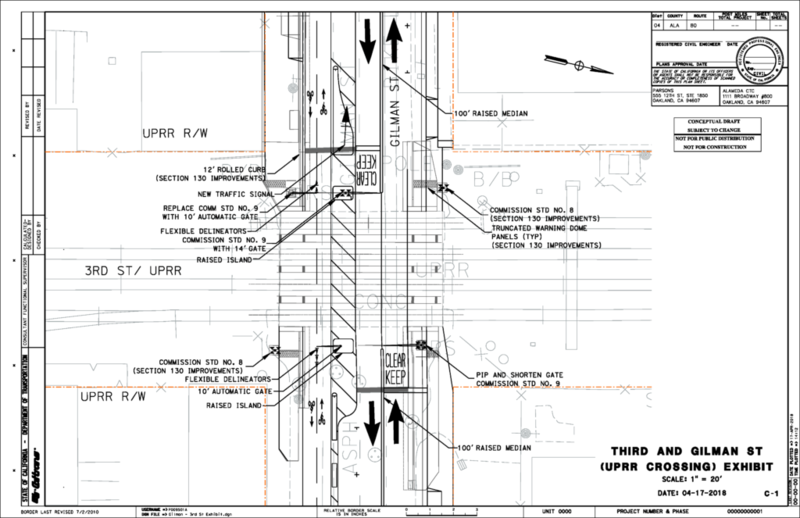 In order to make the approach to the overpass nearly as inviting as the overpass in order to maximize the utility of the overpass, the segment of Gilman along the route between the Codornices Creek path and the overpass will be upgraded for cycling. The route from the Codornices Creek path to Gilman follows Fifth, Harrison, Fourth. From there the route is along Gilman. The project will build a two-way cycle track on the south side of Gilman from Fourth to Second and cycling path on the south side of Gilman from Second to the eastern landing of the overpass. 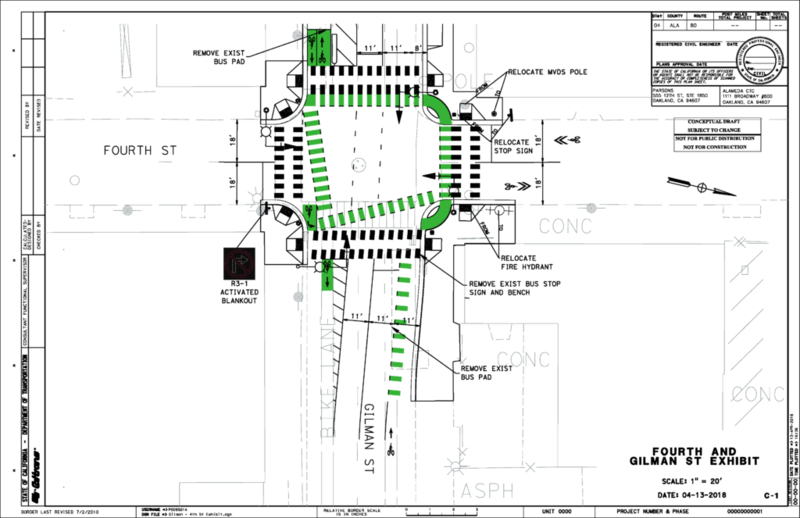 As the route on Gilman crosses four intersections, each intersection will also be upgraded to accommodate cycling. The current designs are shown below with some explanation of each. Clicking on each image will bring up the more detailed pdf version. Feel free to suggest further improvements, ask questions, or make other comments by clicking “Leave a comment” in the menu just below this post. People cycling the route westbound cross Gilman here to access the cycle track. This is relatively simple as there are few motorists on Fourth north of Gilman and people cycling need only ride straight ahead across Gilman and then turn right into the cycletrack. People cycling the route eastbound have to cross Gilman and Fourth, making this direction more complicated. The current design has people ride across Fourth and then wait in a bike box to then turn and ride across Gilman when the light changes. The current design appears to only have room for a person or two to hand out on a bike in the bike box. It also requires hanging out on Gilman with physical protection, which is counter to the purpose of all the upgrades. This purpose is to provide a route as physically separated from motorists as possible so that more people feel comfortable using the overpass. The bike box also requires people using it to make a really sharp turn. While this is from a stop, doing so from a stop is exactly the kind of turn that is the most difficult to make on a bike that has kids or other substantial weight on the back. Women in particular struggle with this because the maneuver requires a lot of upper body strength to keep a bike loaded in this manner from going over then the front wheel is turned hard to one side at a stop. Third and Gilman is better known as the railroad track crossing. This is straightforward. There will be railroad crossing gates across the through cycling lane in each direction in advance of the tracks, just like for motorist lanes. Crossing Second between the cycletrack and cycling path portions of the route only requires crossing one lane of motorists and only motorists turning right from Gilman to Second. Consequently people crossing only have to look at one spot in the road for motorists who might not yield to them, and those motorists are turning right meaning they are making the slowest movement. This is almost as safe as a crossing can get short of eliminating it entirely (it would be a bit safer if there were an eastbound lane just for motorists turning right, but there is not sufficient street width or length from the roundabout to the west). 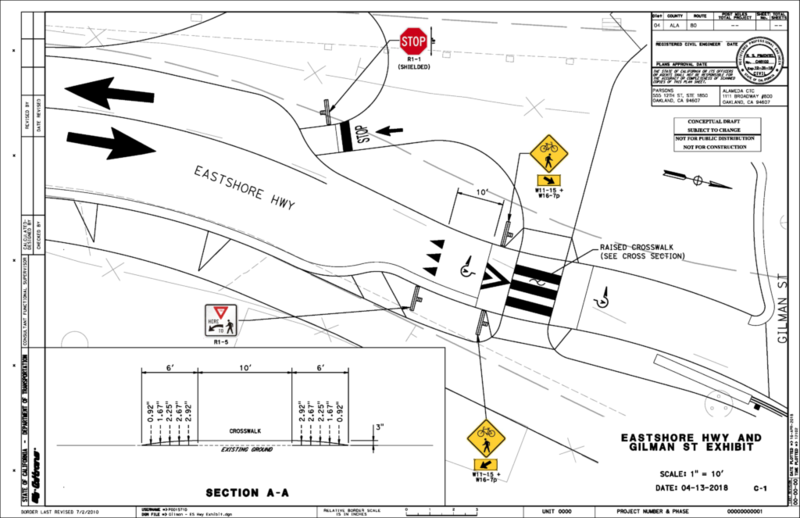 Eastshore Highway is one lane, one-way for motorists at the crossing. The site lines are such that motorist can see people crossing from some distance away. Motorists are also slowing in preparation for entering the roundabout ahead, which requires them to look for and yield to motorists in the roundabout. As a final safety measure, the crossing will be on a speed table, which is a wide, flat-topped speed hump. Local examples of these are the new crosswalk on Masonic at the Senior Center north of Solano and two street crossings along the Manor Way path (Peralta and Ordway). The HAWK signal on San Pablo at Dartmouth was finally turned a couple months ago. This provides the critical link in Albany’s most relaxed cycling network. 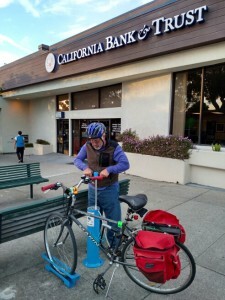 It allows riding between the Bay Trail and the Ohlone Greenway, and all points between, with only six blocks on street, all of them on Dartmouth, which has among the fewest motorists of any Albany street. This network is shown on the new maps below. 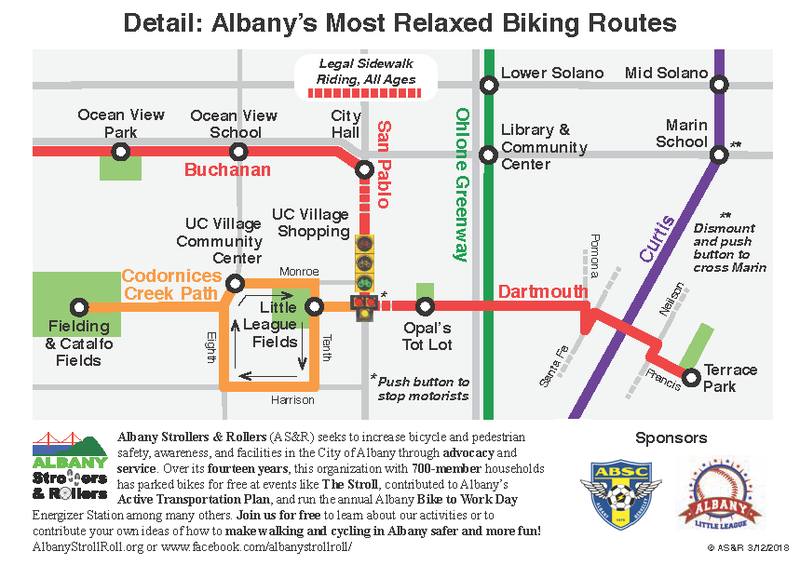 The maps are sponsored by the Albany Little League and the Albany Berkeley Soccer Club because using the network, it is also possible to ride to and from the Albany Little League fields and the soccer and softball fields at the west end of Codornices Creek with minimal exposure to motorists as well. 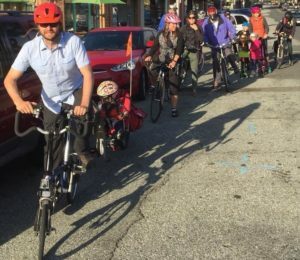 Let your family and friends who have been interested in biking, but not if it means mixing it up with lots of motorists, know there is a network for them now. 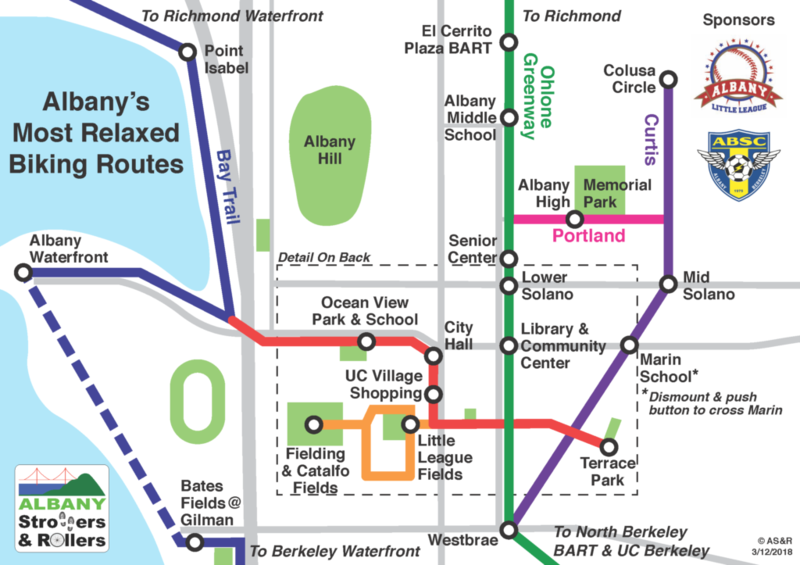 In fact, it is one of the most comfortable networks connecting homes to destinations in the urban East Bay. Clicking on the map images below brings up higher resolution, scalable versions.